At the Annual General Meeting of the Choir, retiring Chairman Gwynfor Evans reflected on a most successful year in which the Choir performed at fourteen concerts and five weddings and gained eight new members – three of them under 20! The Choir currently have 60 members. 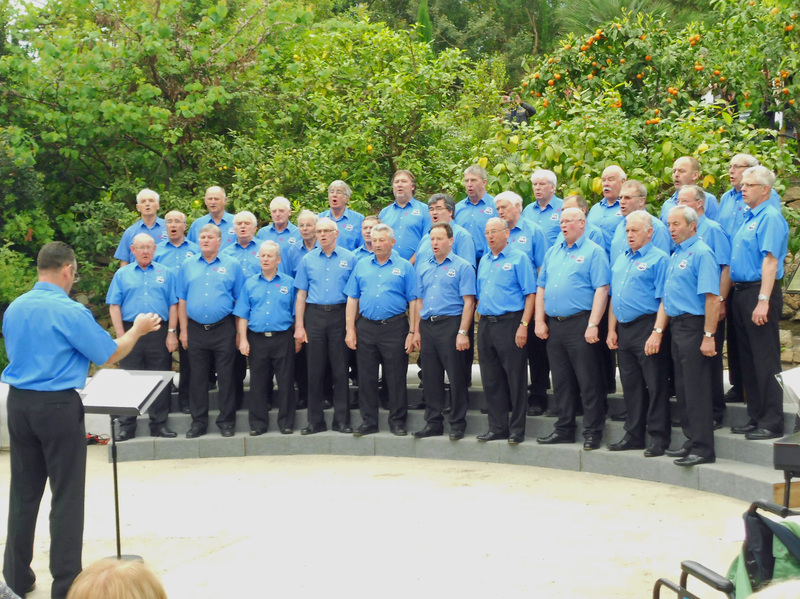 The Supporters’ group had begun and we had a very successful first visit to the Cornwall International Male Voice Choir Festival in May where the Choir enhanced its reputation by singing well at two concerts and two short sessions at tourist venues. On a sad note we said goodbye to two old friends in Ray Richards and Jeff Davies (Jeff the Court) and the choir had been proud to sing at their funerals. 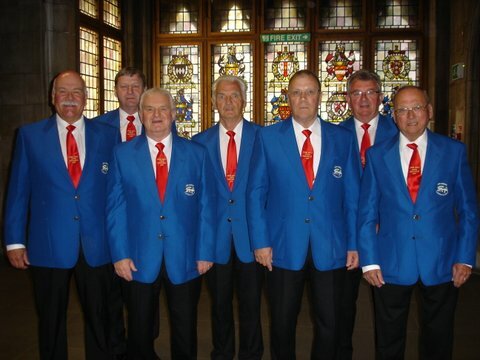 As well as Gwynfor retiring, David Morgan and Donald Bufton also stood down as committee members and the choir are indebted to these gentlemen for many years of service on the committee and the other work that they have done for the Choir. Happily, they will all three continue as singing members. Ian Coldrick takes over for 2014 as Chairman and Viv Jones as Vice-Chair. Bob Jones continues as Treasurer and Lee Houlsby takes over the role of Secretary from Bill Bain, who remains as Events Manager. Committee reps for each section of the Choir are as follows : 1st Tenor: Barry Pugh, 2nd tenor : Graham Davies, 1st Bass : Derek Hope, 2nd Bass : Brian Like. Viv Jones continues as Stage Manager, Brian Price as Wardrobe Officer and David Bridgeman as Librarian. The choir will be visiting Ypres next year to sing at the Last Post ceremony at the Menin Gate and also giving a concert at St George’s Memorial Church on the weekend of 26th to 29th Sept. We have 32 choristers and partners booked, but we may be able to access more rooms at our hotel in Lille and we have space on the coach for supporters. If you would like to come or put your name on the reserve list, contact Bill Bain straight away as we need to book extra rooms in the next week. Following an initial meeting in October the Supporters group met to get organised recently and are planning to meet again about four times each year. The group decided not to have a formal committee, but Megan Jones will act as Co-ordinator and will keep everyone informed and included. 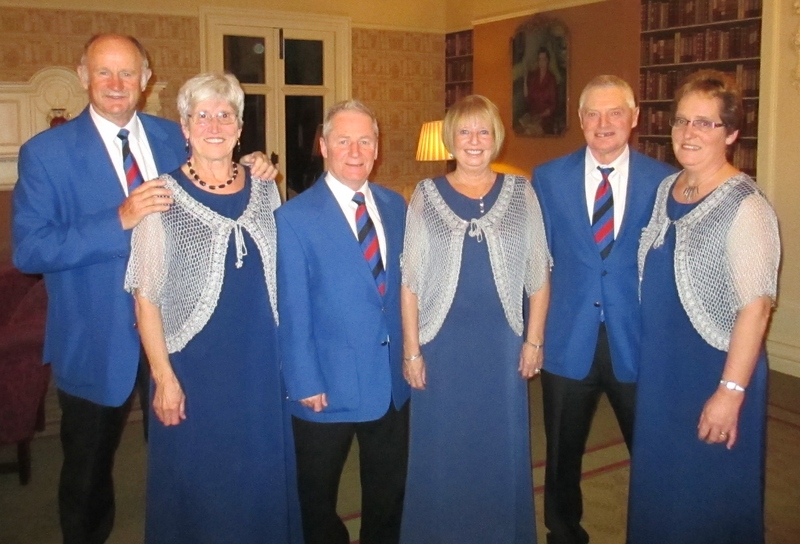 The group confirmed that their aim is to involve wives, partners, ex-choristers and vice-presidents in a social network which can help the choir as well as meet for social events. They will also provide feedback to the Choir committee, ensuring that the views of the wider Choir community are heard. Meetings will be in the Greyhound Restaurant at 8pm on Mondays at least four times per year. The first 2014 meeting will be on Monday January 27th. The Choir were delighted to take part in a concert organised by Builth Ladies Choir at the Metropole Hotel in Llandrindod where the two choirs combined to provide the finale of a very successful evening which raised funds for the Welsh Air Ambulance . It was also a rare treat for three couples who are stalwarts of the two choirs to sing together. Pictured below are Jeff and Wendy Thomas, John and Angie Carruthers and Roy and Jayne Jones. The Choir took part in another Remembrance Concert, this time in perhaps less glamorous surroundings than the previous week! This time was for the local branch of the British Legion in Alpha Church. The cast on this occasion may not have had international status, but nonetheless an excellent evening of music was enjoyed by all with delightful contributions from Builth and Llanelwedd Primary Schools and some talented musicians from Builth High School. The accent on youth was evident as the YFC sang songs from their recent national prize-winning musical, conducted by our own Adrian Morgan. 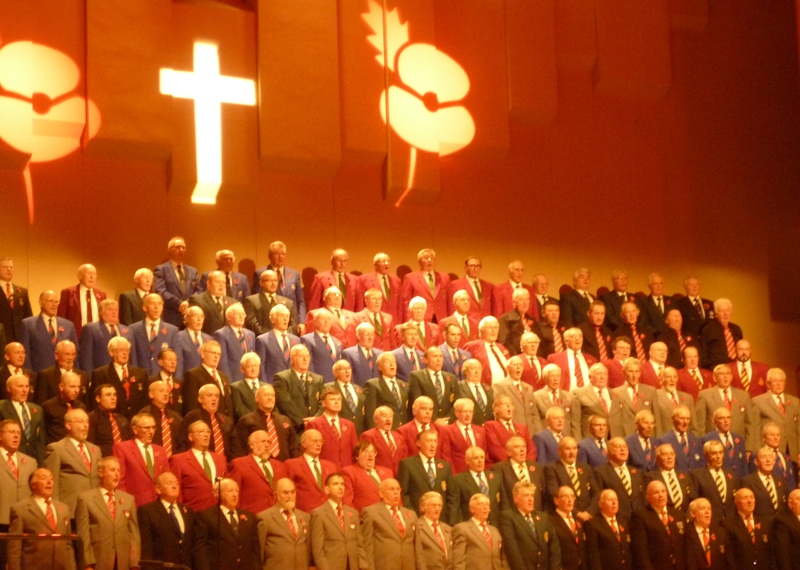 Last weekend Builth were part of a 350 massed male voice choir which took part in the Welsh Festival of Remembrance at St David’s Hall, Cardiff. The evening, compered by Sara Edwards, featured performances by the Hwyel Boys and Girls Choir, Over the Rainbow star Sophie Evans, the Regimental Band of the Royal Welsh and the National Symphony Orchestra. A highlight of the evening was the massed choir backing the vocals of Russell Watson in a new song to be released in support of service charities. “Homeground” is a haunting piece arranged by Alwyn Humphries, Wales’s most prolific arranger, who also conducted the massed choir during the evening. Along with accompanists David Last on the piano and David Geoffrey Thomas on the organ, the choir were warmly applauded. The audience were treated to some superb music on a Remembrance evening which will certainly be remembered by all who took part and attended. At a recent meeting, wives and partners of former choristers agreed to join a Supporters’ Group which will meet occasionally on Monday evenings. The aim of the group is to involve more people in the life of the Choir and to improve communications with the wider Choir community. The group’s first informal meeting will be in the Greyhound restaurant at 7:30pm on Monday 18th November and it will meet every month or two after that. It is hoped to organise some social events to add to the Choir’s calendar. Membership is open to all wives and partners of current and former choristers, to Vice-presidents and to those who have retired from the Choir. The Choir recently made the long trek to North Powys and the Public Institute in Llanfair Caereinion to provide a concert for local charities. The acoustic in the Institute was excellent and the choir sang well for an appreciative audience and later enjoyed the local hospitality. For Chairman and compere Gwynfor Evans it was a trip down memory lane to the haunts of his youth and many of the audience seemed to remember him well! The Choir are pictured here with Viola Evans and Geraint Peters of Llanfair Caereinion. The Choir’s recent invitation to potential choristers paid off with around twelve men joining us at our Open Night. We hope that they enjoyed the taster session and that they will become long-time members of the choir. We’re aiming to get them on stage with us sometime in the New Year. The Choir took part in an evening of entertainment at the Welsh National Sheepdog Trials at Bryn Thomas Farm, Penybont. The Choir sang two groups of songs to a packed and receptive audience in the event marquee on the Trials Field. Second Tenor, Roy Jones, was competing in the Trials the following day and received best wishes for a successful run from his friends in the Choir. Choir performing “Hallelujah” in the marquee. 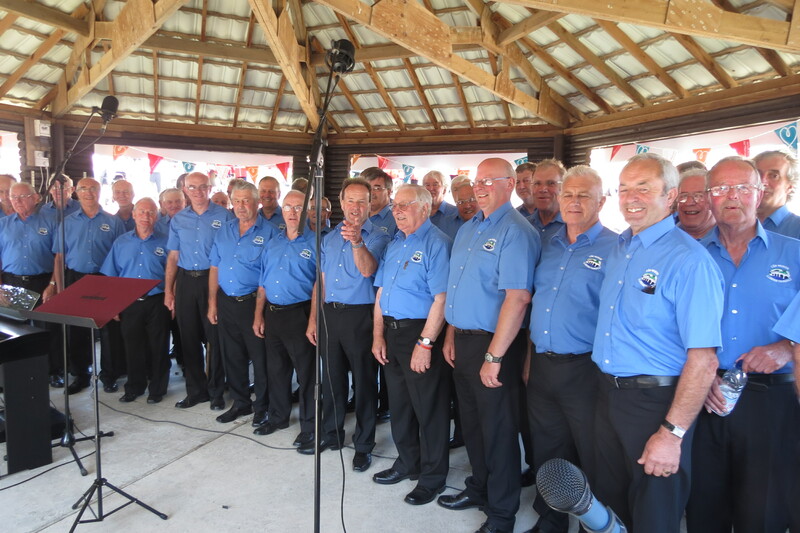 The Choir was delighted to be asked to perform at the Royal Welsh Show for the first time this year, the fiftieth anniversary of the Show on its present site. We sang for three half-hour sessions in the bandstand and were well-received by the show-goers relaxing in the afternoon sun on the last day of record-breaking attendance. As usual the choir was accompanied by Ann Bufton, who was able to take a break from her work in the Show’s Offices to play with her usual flair on the choir’s new keyboard. The three programmed slots were shared between Deputy Musical Director Adrian Morgan and Musical Director Luned Jones who is still recovering from her car accident at the end of last year. Compered by Choir chairman Gwynfor Evans, the choir sang a mixture of songs old and new from around the world with a strong emphasis on old Welsh favourites. The PA system was excellent and gave the crowds the sound of Builth Choir at its best. Singing outdoors can be difficult, but the choir greatly enjoyed singing in the bandstand which enabled the singers to hear the harmonies of all parts of the choir. It also provided shade and some breeze to alleviate the heat of the sun in the current heatwave. 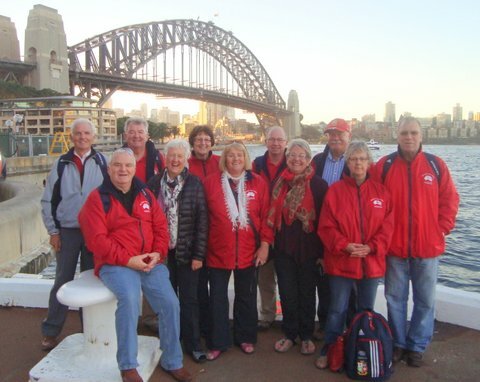 Pictured below in Sydney harbour are most of the party from Builth MVC, together with Eifion and Gaynor Astley from Newtown Choir, who followed the British and Irish Lions rugby team in Australia and sang as part of the official Lions Choir over the last three weekends of the tour. As well as enjoying the famous Lions’ victories over the Wallabies, the singers took part in three major concerts in Brisbane, Melbourne and Sydney and sang to entertain fans at pre-match functions, performed for several TV outside broadcasts (like the one in the link below) as well as some more informal singing sessions in a number of locations. The Lions Choir took part in the opening ceremony on the pitch before the Brisbane Test where they performed with the Qantas Youth Choir and a Dijeridoo band! At the formal concerts, the stages were shared with the Tara Singers, the Australian Welsh Choir, the Australian Rugby Choir and members of Sydney Male Voice Choir and the Sydney Cantorion. 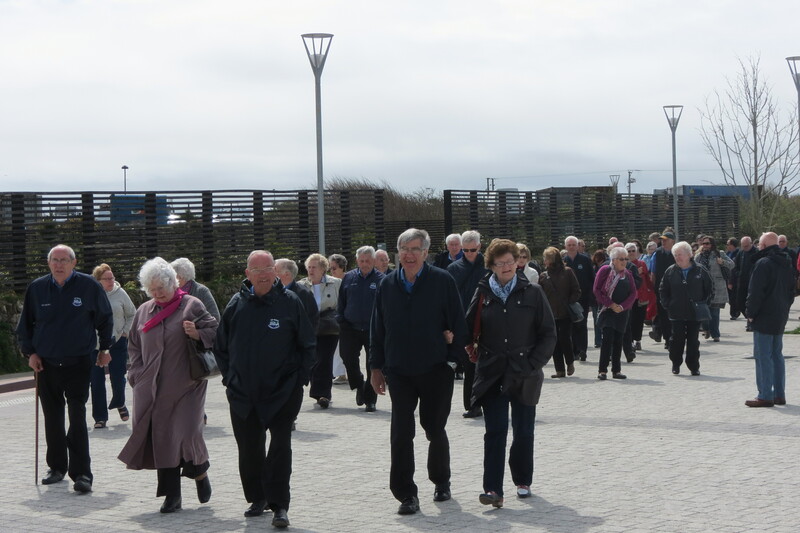 The Builth singers enjoyed meeting old friends from previous tours and making new friends from choirs all over the home islands. The Lions Choir was conducted by Haydn James and accompanied by David Last and like the rugby team had a majority of Welsh members. The party stayed firstly in Surfers’ Paradise south of Brisbane, then enjoyed all the tourist opportunities that the beautiful cities of Melbourne and Sydney provide in the sunny Australian winter. For most of the Builth party, this was their first Lions tour and all agreed that it had been the trip of a lifetime with some wonderful memories of great rugby, great comradeship and of course, great singing. The seven Builth choristers pictured below are travelling with the British and Irish Lions Choir to Australia in June and will be singing at the Test matches and at concerts in Brisbane, Melbourne and Sydney. This picture was taken at the Royal Courts of Justice where the Lions Farewell Dinner was held, before the squad flew off to Australia via Hong Kong. The Choir will follow in time for the first Test match in Brisbane. A packed house at the Welsh Stage on the Hay Festival site saw the four choirs of Brecon, Builth, Rhayader and Talgarth combine for an evening of song and to raise funds for the local branch of the Samaritans. In spite of some challenges in seating the choir of some 130 choristers, the massed choir performed well – singing against the wind on the canvas and the distant drums and throbbing bass of a rock band on the other side of the Festival. The capacity audience applauded enthusiastically as the choirs and soloists Elizabeth Tiley and Paul Sweeting went through a varied repertoire of music. 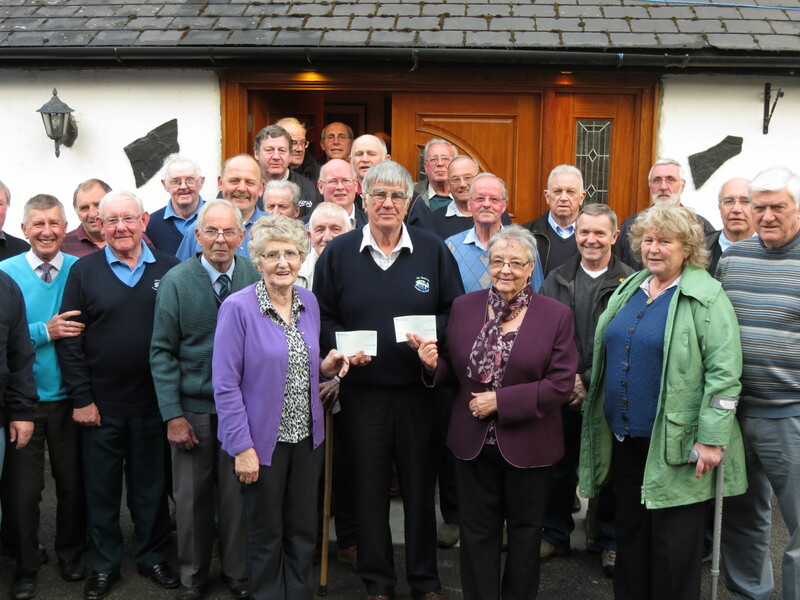 Some of the Choir are pictured above as President Jim Evans presents cheques for £600 to Margaret Watkins and Margaret Evans. The money was raised through a concert earlier this year and is donated to the Cystic Fibrosis Trust in memory of Bryan Watkins and to Cancer Research UK in memory of Brian Evans, two old friends from the baritone section who died last year. The Choir has recently returned from Cornwall where we appeared for the first time at the Cornwall International Male Voice Choir Festival. We performed in four concerts in various parts of the county and sang with, and listened to, many other choirs over the May Bank Holiday weekend. 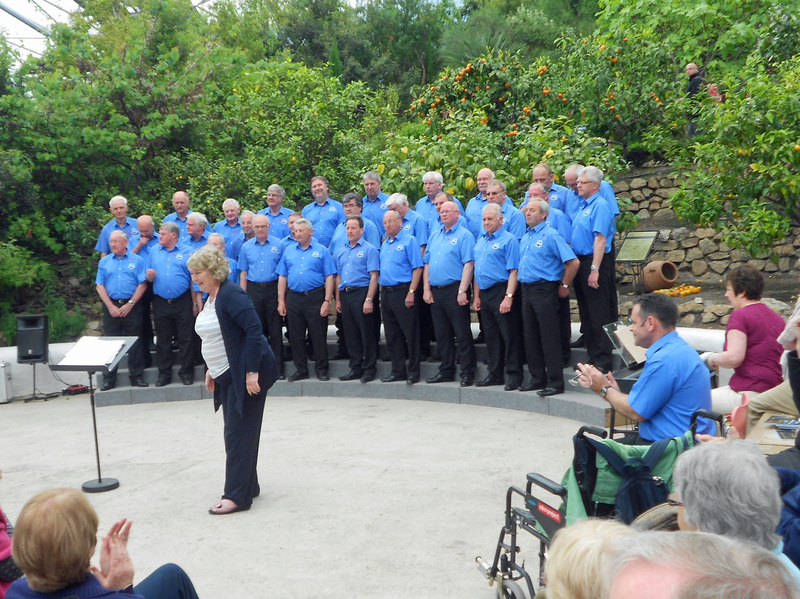 We opened with an afternoon concert at the Heartlands Heritage Centre, Redruth and were given the honour that same day of opening the International Gala Concert at the Hall for Cornwall in Truro. 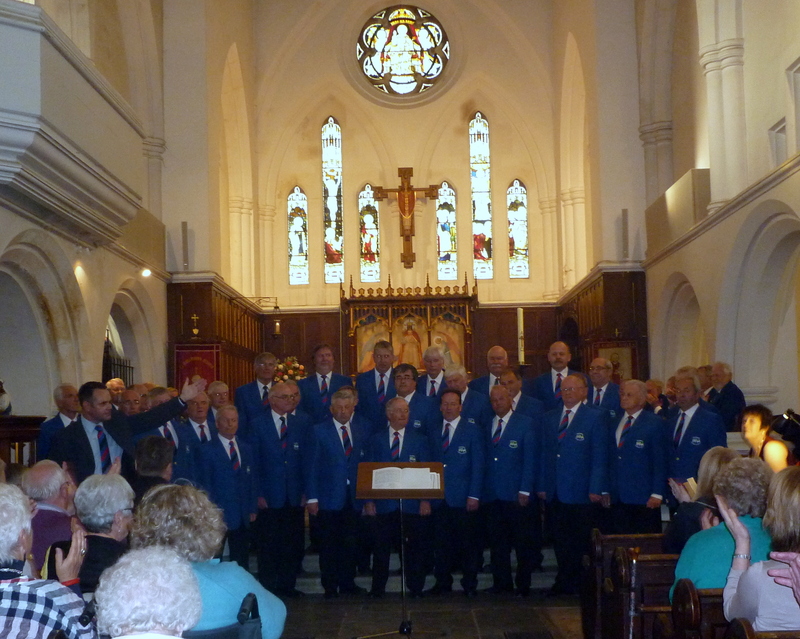 On Sunday after a day of sightseeing, we joined Cornish Choirs Newlyn and Praze Hayle and the Sydney Male Voice Choir, who are on a European tour, at a Regional Concert in Hayle. 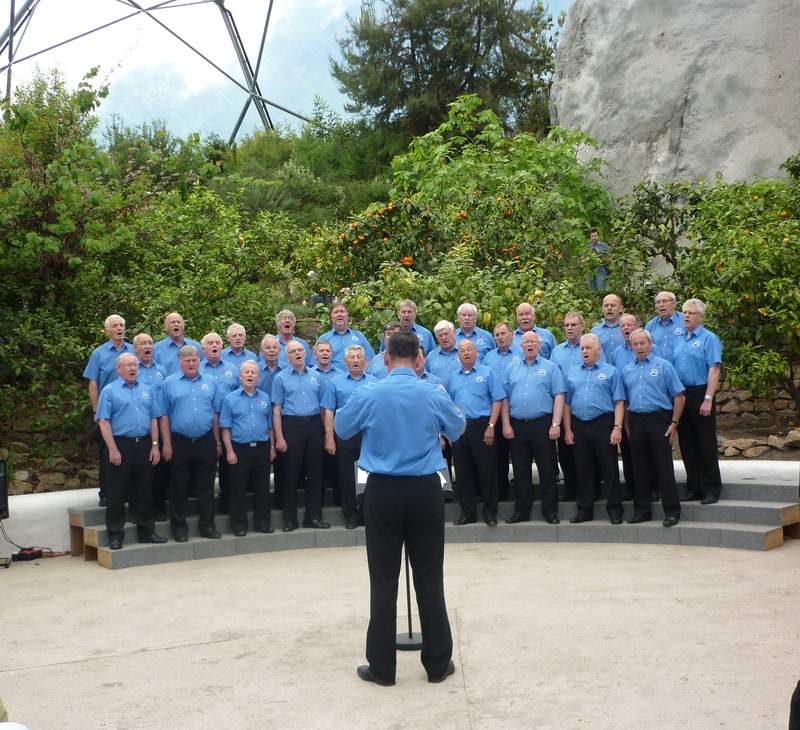 Monday afternoon saw Builth entertaining the Bank Holiday crowds in the Mediterranean Biodome in the world-famous Eden Project. On that evening, many of the touring party attended the final International Concert in Truro and enjoyed relaxing in the audience for a change and reviewing all the other choirs from around the world. The Festival is the largest of its kind in Europe and the Builth Choir were delighted to receive many compliments on our singing which compared very well with the other choirs attending this prestigious event. 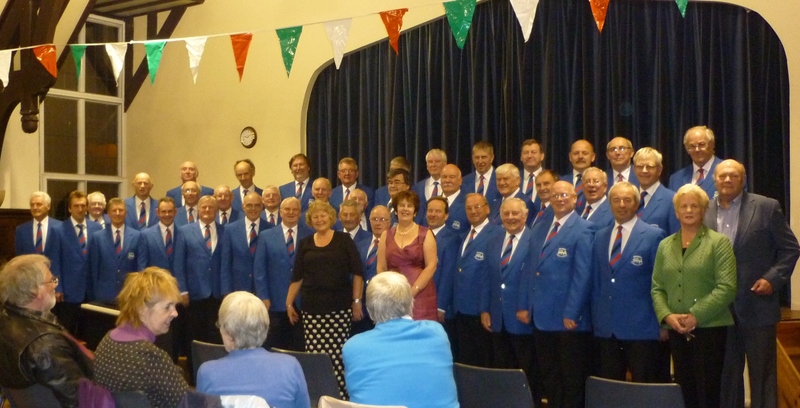 A packed Builth Sports Centre applauded a wonderful evening of music as the Builth Choir combined with the “Gentlemen Songsters” from Dudley and soloist Kees Huysmans to provide a varied and entertaining programme of song for the St David’s concert. 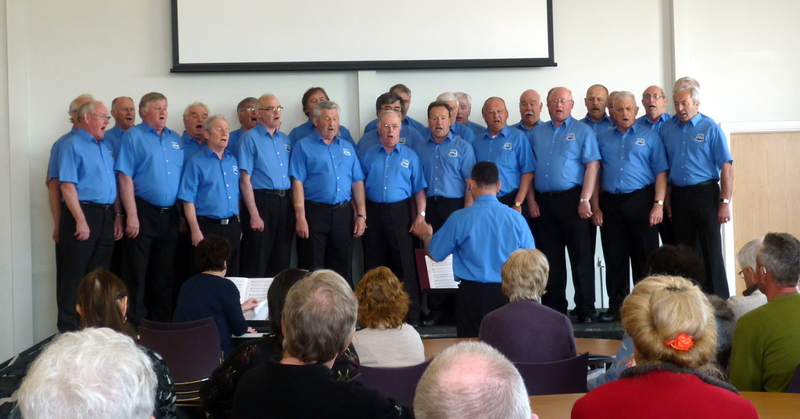 The “Songsters” sang eight songs including a barbershop group’s rendition of “When I’m 64” and concluding with the contrast of “Nessun Dorma”. Soloist Kees Huysmans, a Welsh domiciled Dutchman, showed the powerful bass-baritone voice which won him two 1st prizes at national Eisteddfodau. His six songs were a selection of Welsh and English ballads and his encore was a lively “If I were a Rich Man” an old favourite from “Fiddler on the Roof”. 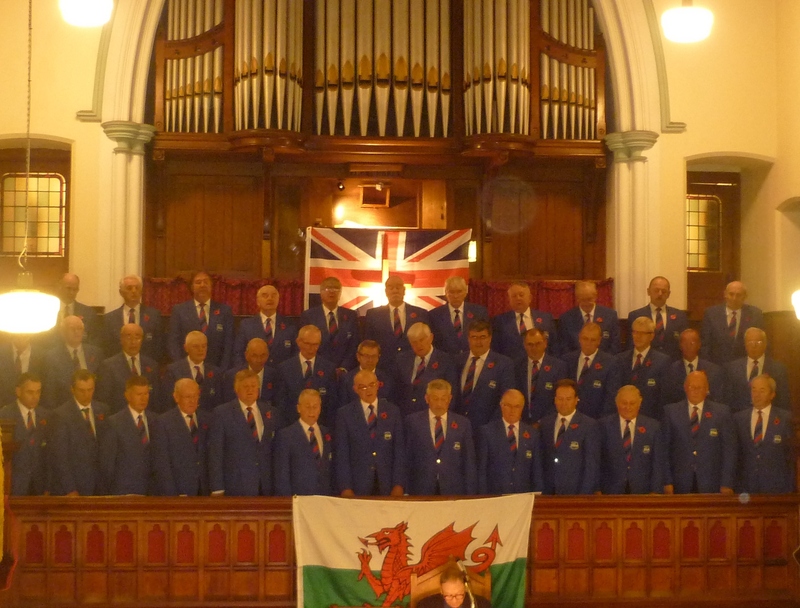 Builth as host choir, gave a shorter programme than their guests but sang with control and passion, beginning with a version of the Leonard Cohen song, “Hallelujah” arranged by KG Arnold of Blaenavon Choir who was in the audience on the evening. Builth’s contribution concluded with the powerful “Tangnefeddwyr”. The two choirs combined in the rousing “Stout-hearted Men” and Soldiers’ Chorus, an acapella version of “My Lord What a Morning” and the unusual sound of “Gwahoddiad” sung simultaneously in Welsh and English! The hall’s decor was added to by the giant leek and daffodil made by pupils at Ysgol Dolafon, Llanwrtyd. Diolch yn fawr blant! Click for Youtube “Hallelujah” performance Thanks to Jayne Jones for photos. 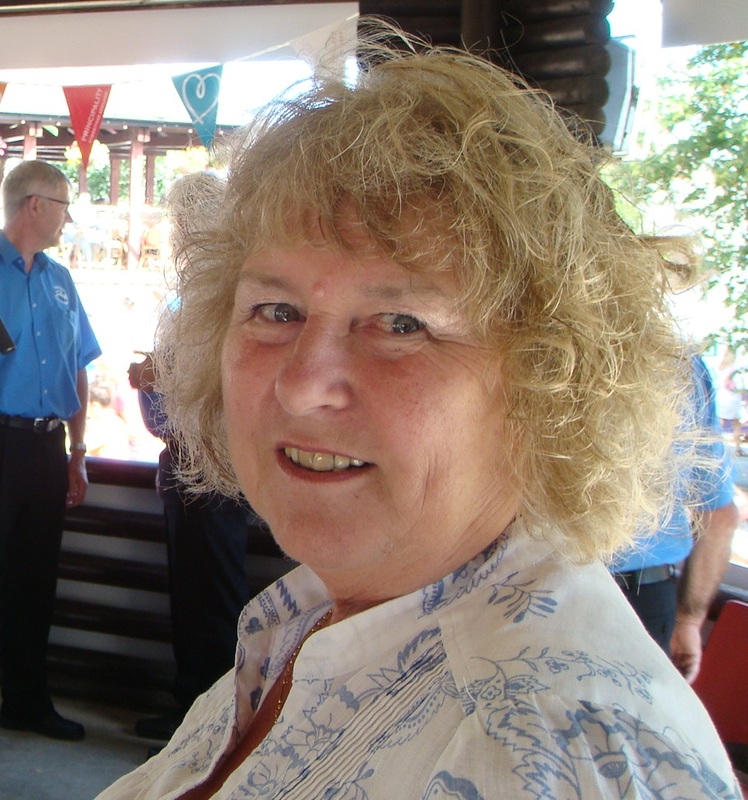 The choir was delighted to see Musical Director Luned Jones in the audience, recovering from her traffic accident. Although in a wheelchair she was happy to be back in Builth and enjoying the efforts of the choir she has spent so many years developing. Deputy Director Adrian Morgan has taken over during Luned’s absence and he was as usual supported by the talented Ann Bufton on piano. The concert was dedicated to the memory of our old President Bryan Watkins and his fellow-baritone Brian Evans who both died last year. We were glad that many of the families of our old comrades could join us on the evening and we expect to make a substantial donation to the Cystic Fibrosis Trust and Cancer Research in their names. We now know our itinerary for our participation in the Cornwall International Male Voice Choir Festival from May 3rd to 7th. We will be staying in Newquay and singing in an International Concert in Truro on Saturday 4th and a regional Concert in Hayle on Sunday 5th, where we will meet up again with old friends from Newlyn Choir. 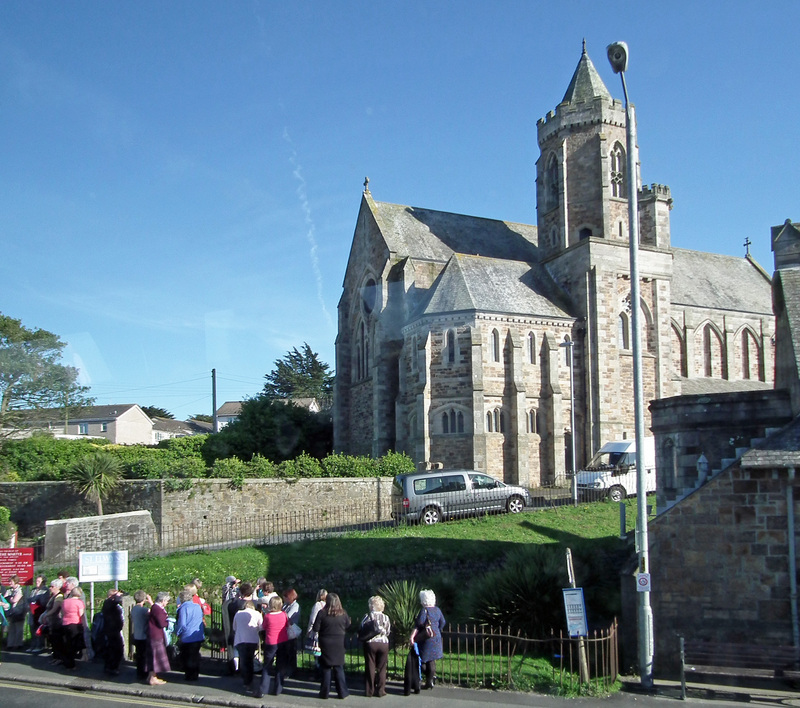 In addition we will have two informal concerts at tourist destinations during the daytime: on Saturday 4th at “Heartlands” Heritage Centre near Redruth and the Eden Project on Monday 6th. Both these concerts will be at 2:30pm.